Today is the liturgical commemoration of Saint Joseph, Mary’s husband and Jesus’ father or adoptive father, depending on your tradition. He was, the gospel genealogies report, loosely descended from David, but we think of him more as someone tossed and turned by angels in dreams, a man who could load up a donkey at a moment’s notice. It’s a villager in Nazareth who tells us he was a carpenter, a woodworking artisan, a stonemason, or perhaps a contractor. But beyond that, we know nothing about him. He disappears from the gospels after he and Mary lose the adolescent Jesus and find him again in the Temple. Tradition says that Joseph did not live to see his son’s career take off, nor its bitter end. He never knew him as a risen Lord. What carried him away? Did he die of infection or flu? Was he throttled by a client in a dispute over a bill? Did he fall from a scaffold or bleed out after an accident in the shop? If you believe the medieval tradition that he was already ancient of days when he married the Maiden, he might simply have died of old age. No one knows his end. And no one knows his backstory either—what kind of a boy he was, whether he dutifully ate his peas or tucked them in his cheek to feed them later to the cat, whether he liked bold colors or preferred more muted tones. Had his sleep always been fitful, punctuated by dreams, or would his mother swear, if you could ask her, that he hit the pillow and was out like a light, sleeping like a log till noon? How did he and Mary get together? Did Joseph meet her for the first time in her father’s living room? Picture it: his parents bring him all dressed up to Anna and Joachim to arrange the union, two good families making a deal for their kids. The older folks drink tea, talk it over, Mary and Joseph quiet, in the corners, eyeing each other, sizing up their chances. Or this: they’d known each other since they were small. They ran with a pack of neighbor kids chasing balls into the street and building forts together, until the girls started being women, and the boys, men; and so it seemed natural, it was always just assumed, that they’d be wed. And so it came to pass. Or not. Maybe he really was already old and widowed when they were betrothed, and he was a caretaker only, a protector God appointed as guardian of a divine child, a safe sexless man with a white beard and a lily blossoming from his staff, providing respectable cover for a perpetual virgin Mary. Did he love her, then, like a father, venerable, affectionate and kind? Or did he love her like a lover, young and vigorous and eager and full of joy? Or like a man bound in duty to love her who keeps his word? Did they have chemistry? Or did they respect each other, grow on each other over the years, momentous secrets between them, stories no one would believe it they told them, so much fear, so much awe? Some say that Joseph was by character and upbringing devout, and therefore unsurprised by angels, always expecting intervention, unquestioning in every ordeal. He sang psalms and praised the Lord in his candid heart as he trudged to Bethlehem, shivered in the stable, fled into Egypt, journeyed back and settled in Nazareth instead of going home. He was sweet and calm and uncomplaining through it all. Maybe his mother taught him about life and pain in such a way that it shaped his heart to absorb hard blows. Maybe his father was a man of dignity, and it got bequeathed to him in such a way that he could pull up short at the brink of anger and decide not to expose the pregnant Mary, but put her quietly away. Maybe it was upbringing, example, teaching. He was raised to be loyal. But for all we know, he could have been a rough man, impervious to spiritual things, someone who tried, but to whom it didn’t come easily, and he felt resentful, deprived of a normal life by the commanding voices in his dreams. Maybe he wrestled like Jacob, resisted like Jonah, railed like Isaiah before giving in at last, like his son would give in later, drenched in sweat in the garden. Was he an unlikely saint, a man God pressed into service, and was it grace, and grace alone, that compelled him to rise to the occasion, the sort of grace that throws a switch in your soul when God decides you are the right man for the job? He never speaks. Not once does he utter a word. No “And then Joseph said to the angel…” or “Joseph spoke to Mary, saying…” His silence is deep. Did he never say anything clever or wise or portentious enough for anyone to remark, remember, write it down? Did he say some things that were not edifying, embarrassing, not fit to hand on? Or was he as reserved as he appears, with no need to comment, no need to be heard, no compulsion to intrude on the drama and steal a scene? Did they make him seem distant and aloof to his son, his long silences, his lack of chatter in the workspace, all those quiet meals? Or was it this the child warmed to and absorbed more than any other lesson or skill—the capacity to be and let things be? Was Joseph’s silence the wellspring of the Teacher’s need to steal away at night to hilltops to listen to God, to catch above the din below the cry of suffering and hope? Was this his father’s gift to him when, bloody and accused, he would not be provoked, but stood before Pilate and the cosmos, silent, without a self-defensive word? In Italy they say that once upon a time when things were very bad, the good Saint Joseph heard their prayers and delivered them from famine, and that’s why they celebrate at Guiseppe’s Table every year, feasting with family and friends, strangers and guests, rich and poor. They eat a special dessert that day too, a round cream puff filled with ricotta and topped with red cherries and glazed orange slices. St Joseph’s sfinge would be enough to make me Italian, if I weren’t already. In the United States, people have taken to burying little statues of Joseph in the yards of houses they want to buy, asking him to close the deal for them. He is, after all, the patron saint of real estate agents and house hunters, having found or built the house where Mary and Jesus lived and made a happy home for them under the roof of his care. The 16th century St Teresa of Avila loved him above all other saints, and the first thing she did in her new convents, after making sure the bread that is Jesus was residing in the tabernacle, was to place an image of Joseph in a prominent niche and ask his blessing on the house and the ‘holy family” of nuns who would come to live and pray there. Because labor movements in Europe had a very pinkish tinge, the Pope, feeling a need to commend work but eschew Marxism, turned to Joseph, who had toiled nobly with his hands, and appointed him to the task. 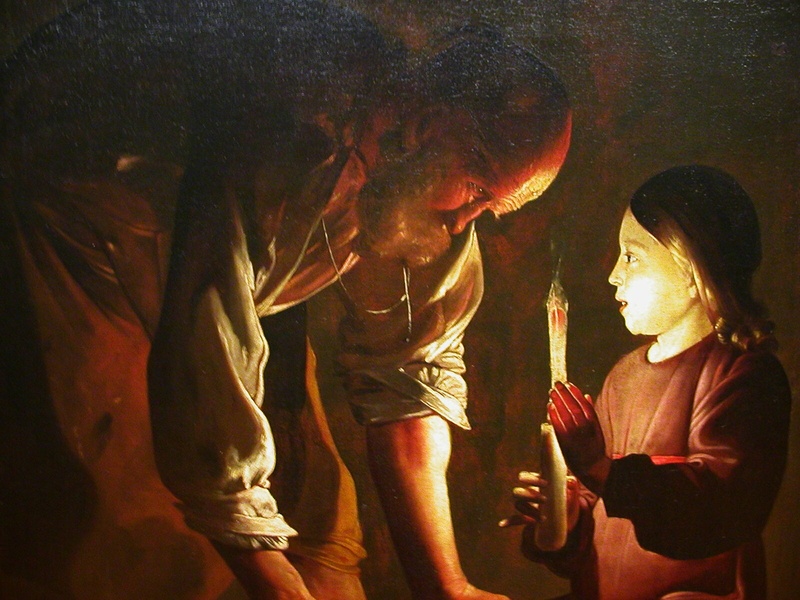 The feast of Saint Joseph the Worker was proclaimed in 1955, and the day set aside to honor all godly labor was May 1, to counteract May Day, a socialist holiday. The Church hoped glad hymns to Joseph would drown out the Internationale. 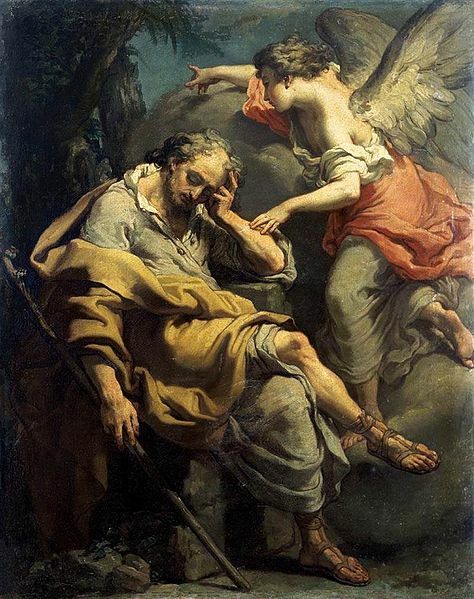 Saint Joseph, father of Jesus, husband to Mary, holy insomniac, packer of bags, maker of useful things, and silent as the mystery you cared for, pray for us. This entry was posted in Marginal Notes, Saints on March 19, 2013 by sicutlocutusest. 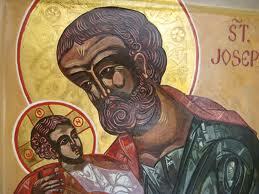 Your rich, freewheeling reflection opens all kinds of new understanding of the gospels’ mystery man, Joseph. Thank you for new insights. Mary – I so enjoy reading these reflections. Your Roman Catholic past slips out to enrich your writing and it makes this long-retired Catholic feel warmly connected to the great cloud of witness.